Apparently, all is not as it seems with the Benitezes! They’ve been claiming that it was STI who wanted to commercialize the JASMS QC property on EDSA, but as it turns out in this blog… IT WAS THE BENITEZES who originally wanted to KICK JASMS OUT of that PROPERTY AND PLACE IT IN FAIRVIEW!! In the mid-1990s, Jolly Benitez, the father of PWU President Kiko Benitez, had an ambitious plan. He wanted to transfer pupils and students of JASMS in Quezon City to some remote location in Fairview. The idea was simple and straightforward. For the Benitezes, the JASMS property located in EDSA had grown so much in value that Jolly figured they would get more profits if they just evict the school community there and turn the entire place into shopping malls and condos. Jolly, a known Marcos crony and former deputy minister of Imelda Marcos’ Ministry of Human Settlements, had commissioned the formulation of a development plan for his commercial property project. 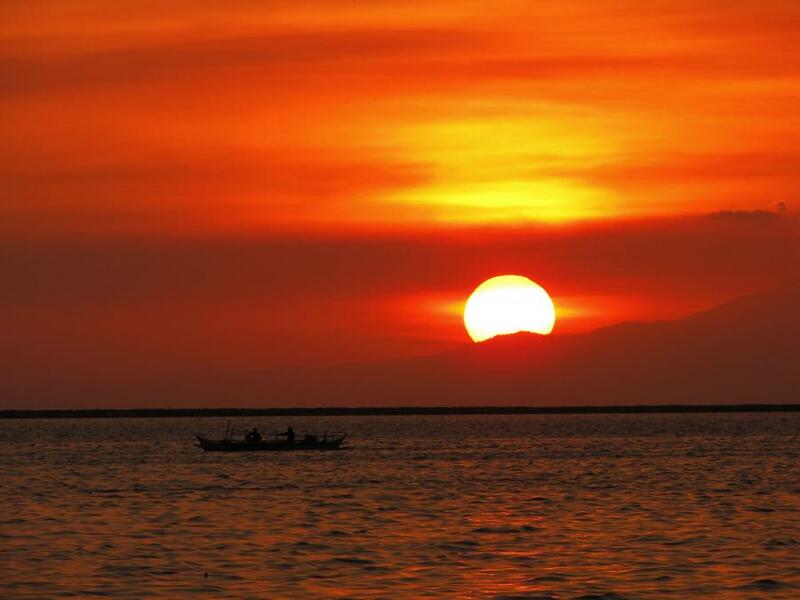 Saving the beautiful sunset on Manila Bay isn’t a simple matter of keeping Manila Bay the way it is right now. If you’ve ever walked from Quirino Grandstand to the CCP Complex, you will pretty much figure out that this is where all the water and solid waste pollution from Manila ends up. The Manila City Government has banned people from swimming in the bay and a number of national government agencies have warned people not to eat any fish or shellfish gathered from the bay. This is because the waters of Manila Bay are highly polluted. With the presence of ports, sea-based sources of pollution around the bay are from ships and motorized boats. Twelve oil spills were recorded in 1995, but it was in 1999 where the highest total volume of oil spill occurred in the Manila South Harbor and Limay, Bataan. Increased presence of oil and grease in the waters are attributed to maritime activities at the harbors, together with the presence of oil terminals and the discharges from industries. These factors directly impacted the health of Manila Bay’s waters. Aside from oil spills, trace metals such as copper, cadmium and zinc at the surface of the water were found at the bay coming from sea-based and land-based (e.g., domestic sewage, industrial effluents, runoff, combustion emissions, and mining operations) sources. In 1996, concentrations of 16 commonly used pesticides in surface sediment was found including dichloro-diphenyl-trichloroethane (DDT). Polycyclic aromatic hydrocarbons (PAH) found in Manila Bay sediments have been influenced by human activities. PAH come principally from petrogenic sources (e.g., oil discharges from ships, refineries and industries) and pyrolytic sources (from combustion sources). Pesticide residues from rice paddy water draining into irrigation canals, which later on empty into river systems and eventually flowing into the surrounding lakes reaches the waters of Manila Bay. Compounds from these pesticide residues find themselves in food items with metamidophos, endosulfan, chlorpyrifos and diazinon among the common contaminants. While chronic toxic effects on inhabitants of the bay are not found, impairment of marine biota were more evident. In 1997, polychlorinated biphenyl congeners (PCBs), compounds common in transformers, hydraulic fluids, paint additives and pesticides were determined in sediments and oysters sampled from Manila Bay. The increase in the nutrient concentration and presence of nitrate, ammonia and phosphate in the bay,from the ’80s, through to the ’90s and beyond are not only attributed to agricultural runoff and river discharges but also on fertilizers from fishponds. In fact, the copper and orange tinge that makes Manila Bay sunsets so beautiful is partly caused by the air pollution, while the multi-colored sparkles of the bay’s water are actually from the layers of oil floating on its surface. To get a red sky, you need aerosols, explains A. R. Ravishankara, director of chemical sciences at the NOAA Earth System Research Laboratory in Boulder, Colo. Aerosols are solid or liquid particles suspended in the air that originate from both natural processes and human activity. But “in a large city, you can ignore natural aerosol products for the most part” because the number of aerosols produced by human activity far exceeds natural sources, says Sergey Nizkorodov, a chemist at the University of California, Irvine. Human-generated aerosols can enter the atmosphere directly, as is the case with soot emitted by internal combustion engines in cars and trucks, he explains. Aerosols are also produced when molecules in the gaseous state enter the atmosphere and react with other chemicals, he adds. A classic case: burning fossil fuels releases sulfur dioxide gas into the air, which then turns into sulfuric acid aerosols. In a way, saving the sunset on Manila bay may actually mean keeping things the way they are and that is something that is really the opposite of what ought to be done. Pasig River Avenger departs from momentarily from its cause of reviving Pasig River and exposing sham campaigns to save it. Today, we take time to expose Silka Papaya Soap‘s attempt to dodge over P1.5 Billion in taxes by filing false Financial Statements from 2008 to 2011 that under reports its income by as much as 47%. In 2011 alone, Silka Papaya claims to have made sales of just P990 Million pesos, but data from a reputable market research firm reveals that its sales were at P1.5 Billion. Furthermore, according to its Financial Statements from 2007 to 2011, Cosmetique Asia Silka Papaya’s Net Sales amounted to P2,661,288,237. But according to market research data, its actual net sales amounted to P 4,490,682,515. This is a difference of P1.8 Billion of untaxed income! Based on these figures, the total estimated under payment of basic tax is around P350 Million and the total estimated potential deficiency in taxes including penalties may range from P600 Million to P700 Million. But this is just basing the estimated tax evasion on market research data, which just accounts for sales made through large supermarket chains. If we factor in sales made through small convenience stores and wet markets all over the country, the actual net sales of Silka Papaya may be well over P6 Billion and its resulting tax deficiency may as well be over P2 Billion. We hope that this reaches BIR Commissioner Kim Henares and helps her in her campaign to reach her P1 Trillion tax collection target. There’s still no word up to now if the recent Pasig River Fun Run did in fact break any world record. Maybe there is but it appears there’s not much hype around it. Had it broken the record we can safely assume that ABS-CBN, which race organizer Gina Lopez’s family owns, would have already made a lot of noise around the story. Such is the nature of the beast. If the story is negative (no world record broken) it stays silent. Not really surprising since this has been going on for many years now. I’m talking about the silence of those so called advocates of the river’s revival on the existence of industrial facilities along the river and its tributaries. As I said before, this fun run and all the others before it are worthless activities. These do not really address the need to rehabilitate the river. Glaringly obvious is the fact that most if not all of those who participated did not really get involved because of any level of concern for the river. They just wanted the fun of running. That’s all. So in terms of raising awareness and involving more people in the advocacy, I’d say Pasig River fun runs are failures. My biggest issue however is again on the fact that the organizers of this fun run are conveniently avoiding the point that aside from squatter colonies there are industrial facilities still operating along the river and its tributaries. This begs the question: Why are they silent on this? The answer is so obvious. One of the operators of these industrial facilities is major advertiser Unilever. It also just so happens that Miss Lopez is part of the family that owns ABS-CBN. (I know I already stated this above but it has to be repeated for the sake of clarity.) It also just so happens that ABS-CBN benefits a lot from advertising generated from Unilever. Clearly, there is conflict of interest here. How can we expect Miss Lopez to attack all the problems contributing to the continued degradation of Pasig River if she has to protect some interests? President Benigno Aquino III should reconsider the appointment of Miss Lopez as head of the Pasig River Rehabilitation Commission. He should instead appoint someone who has no ties at all to any of these big businesses. Preferably that person should have some engineering background because the degradation of Pasig River is essentially also an engineering problem. It is not a publicity problem that someone like Miss Lopez with her ties to one of the leading media companies in the country can easily solve through fun runs and other publicity gimmicks. Of course, I’d be willing to change my opinion if and when Miss Lopez does come out with a campaign that also addresses head on the existence of industrial facilities in the area. I am challenging her to push for the removal of these facilities. Industries and businesses lined up along the riverbanks have used the waterways as well for dumping toxic wastes. The general population, especially those within its proximate distance also dump garbage and refuse into the river. The government – from the barangay to city and department levels – all failed miserably to enforce tons of existing laws to protect the river and its ecosystem from the depredations. There were continuing initiatives during the past 20 years to help save the river system but most failed to turn back the environmental onslaught against it. The current group spearheading the Pasig River clean up used the run as one of the means to support the revival. The run aimed as well to break the world record of the biggest number of participants in an organized run. To my mind, the greater significance of the number is not so much breaking the world record but creating a critical mass of Filipinos who will consciously contribute to the preservation of the environment. The Pasig River is just one example of an ecological system laid to waste by our neglect and indifference. Many river systems in the country, as well as many of our mountain and forest systems, the air we breathe, the land we live in are suffering from pollution. You may read the full article through this link. So did it or did it not? Did the much-vaunted Pasig River Fun Run held last Sunday, October 10, 2010, break any Guinness World Record? The available information is conflicting. Some reports say the event only broke a local record. Others say it did surpass the existing record of 110,000 running participants set in the Bay to Breakers race in San Francisco, California in 1988. Record or no record, the important question is did this running/marketing/public relations event really make a difference for the Pasig River? If you happen to be an idiot you’d probably believe the press releases that the event raised the people’s awareness about cleaning up Pasig River and protecting the environment. Riiight. You are an idiot. As I wrote before, people who participate in advocacy runs are not necessarily interested in the advocacy part. They just love to run. To say that the more than 100,000 people who joined 10:10:10 did so because of some great concern for the river is simply false. But so what? As some people might say, the more important point is whether the event raised a significant amount of money. Let’s do the math, again. Assuming 120,000 people ran the foot race all of whom paid the registration fee of P250 then the event easily raised P30,000,000. Yes, that’s THIRTY MILLION PESOS! Now, I read somewhere that only half of what was raised will be used to finance a dredging operation on one (yes just one) estero. This begs the question: Will dredging one estero make a difference? Well, I have to concede doing something is better than doing nothing, but here’s a question: How long will an estero remain clean and garbage free if the source of pollution is still there? Another question: How many fun runs does Miss Gina Lopez have to organize to clean up the whole river? Of course, the showbizy answer that will certainly resonate with the simple-minded is “As many as it takes.” Incidentally, a day after the fun run, the organizers came out with a full page ad which had the heading “Believing is the first step.” Didn’t I say simple-minded? I seriously doubt if simply believing actually produces real results. I’m more of a “believe and take the correct action” kind of guy so all this “just believe” mantra is nothing but crap to me. I close this rant with one simple fact — Fun runs do more for their organizers and sponsors than they do for the cause. Many of the fun run participants had other reasons for joining aside from a great love for running. Check out the following comments I found in various places. haynaku **** andun ako sa pila ng finisher’s band when Manny was called on the stage. inde namin kita, akala ng iba joke lang o baka si manny poohkyaw lang. mas gusto nilang makuha ang band kesa alamin. umalis na ko sa pila. nagkakagulo na eh, nagkaubusan kse ng band. baka magka-suntukan pa eh. hehehe..
Hahahaha. Ako chinaga ko e. Mahilig kase ako sa souvenirs! Kaya ko pa sana.. i can stay longer. kaso hanap na ko ng mga kasama ko. badtrip ung pagorganize nila ng pamimigay ng finisher’s band. sana dun nalang sa finish line inabot. (ayan, ngaun lang ako naasar. delayed reaction. hahaha). at meron din inde naman finishers na nag-claim. may pumipila na hawak sandamukal na bands eh. (sour graping). haha.. dapat dun sa tabi ng nagbibilang inaabot. (asar). hahaha! And what is this finishers band they’re talking about? I guess there’s nothing like having an environmentally fashionable wrist band to make you feel like you’ve helped clean up the environment. Kudos to Carlos Celdran for raising awareness on the Catholic Church’s unreasonable and dogmatic views on family planning. Last I heard Celdran remains detained in spite of his readiness to post bail. It appears some powerful hand (not likely to be God’s) is trying to keep him in jail. Who could it be? If it didn’t so happen that Celdran has to leave for Hawaii on Monday to accompany his father I would actually prefer that he be detained longer if only to highlight further the fact that the Catholic Church in the Philippines is no longer anything but an organization of bullies. No question about it, the Church is pushing it and the time has come for the people to see that it has been meddling in State affairs far too long. The church should have a dose of its own medicine. Express your indignation during mass this coming Sunday. 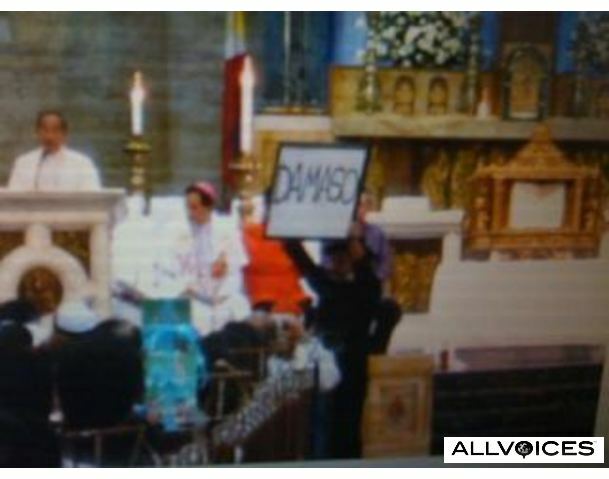 Join the fight against Padre Damaso! Environment Secretary Ramon Paje has highlighted the sad fact that most of our bodies of water are no longer fit for human activity. Of course, he didn’t really need to say it, one need only visit the nearest river to see how bad the situation is. Of course, we all know much of the garbage that ends up in our waterways are made of plastic. In an effort to reverse the pollution that has overrun our bodies of water, the Department of Environment and Natural Resources and various malls and supermarkets have started a campaign that will hopefully encourage consumers to cut down on their use of plastic bags. MANILA, Philippines — Don’t forget to bring a reusable bag when you shop because this Wednesday is the start of the observation of “Reusable Bag Day” where no more free plastic bags will be given to customers. A memorandum of understanding (MoU) was signed during a reusable bag campaign titled PagbaBAG Ko, PagbaBAGo! held at the Department of Environment and Natural Resources (DENR) office in Quezon City last September 23 to observe “Reusable Bag Day” every Wednesday. The agreement specified that all stakeholder-supermarkets should observe “Reusable Bag Day” every Wednesday from the time of the campaign launch. The MoU was signed by the DENR, National Solid Waste Management Commission (NSWMC), Earth Day Network Philippines (EDNP), Philippine Amalgamated Supermarkets Association (PAGASA), Philippine Retailers Association (PRA), and supermarkets, namely Ayala Malls, Ever Malls, Hi-Top Supermarket, Isetann Malls, Makro, Robinsons Supermart, Savemore, SM Hypermart, and SM Supermarkets. They agreed that there will be no more free plastics given every Reusable Bag Day. It also cited the granting of incentives for use of reusable bags in supermarkets to encourage change in the behavior of consumers, but this shall be left to the discretion of the management of the different participating supermarkets. There’s no question that this is a good start. However, it would be better if this is done everyday. That would have a bigger impact and would more likely move people to turn to reusable bags or even the bayong. This initiative should evolve into a bigger campaign against non-biodegradable packaging in general. Sachets are particularly notorious for finding their way into creeks and rivers. Here’s an interesting report from www.philstar.com. I am posting it in full with my comments in bold typeface. MANILA, Philippines – Ortigas & Co. Ltd. Partnership signed a memorandum of agreement granting four hectares of land in Tatala, Binangonan, Rizal to Kapit Bisig para sa Ilog Pasig, which would now serve as a relocation site for informal settlers along the Pasig River. Kapit Bisig managing director, Gina Lopez received the donation in a charity banquet held at the Circulo Verde Guest House last August 31. Kudos to OCLP for this. Relocation sites are important since we can’t just uproot people from their communities without providing them another place to stay. “Our river system has been suffering for decades from all the pollutants that have been dumped in it. We recognize Kapit Bisig’s strategy of taking control of pollution sources and ensuring that the overall waste dumped in the river is reduced,” according to Rex Drilon, COO of Ortigas & Co.
Good of Mr. Drilon to state the obvious about the state of Pasig River. However, being a non-believer in publicity stunts and other marketing gimmicks, I am annoyed by the obvious “praise release” for the benefit of Kapit Bisig and the (also) obvious attempt to force an association between OCLP and Kapit Bisig. Kapit Bisig covers all bases of their massive rehabilitation program through Materials Recovery Facilities (MRFs), information, education, and communication (IEC) campaigns, relocation, and area redevelopment. With the recent appointment of Lopez as chair of the Pasig River Rehabilitation Commission (PRRC), the success of this project is ensured because of guaranteed support from the private sector and government. This is an exaggeration of the facts. Kapit Bisig doesn’t cover all bases. If you notice there’s not one mention about doing anything about the industrial facilities along Pasig River and its tributaries. While it can work on removing squatter colonies, Kapit Bisig seems to turn a blind eye on those manufacturing plants, factories and other industrial facilities in the area. How then can Kapit Bisig’s work be considered a massive rehabilitation program? Hundreds of families living in the Pasig riverbanks had been relocated to Montalban, Rizal and Calauan, Laguna for many years now. The addition of the donated OCLP property in Binangonan, Rizal will provide a relocation site for at least a thousand more endangered families living by the banks of Pasig river. “By partnering with an organization that works as methodically as Kapit Bisig, we ensure a broad scope and maximum impact to beneficiaries,” Drilon added. Publicity, publicity, publicity. As far as I’m concerned, a company that talks too much about its good deeds is a company that is overcompensating for something. In the same ceremony, OCLP also handed over the proceeds of the May 2010 Golf Tourney to Kapit Bisig and two other beneficiaries, Habitat for Humanity Philippines and ANCOP (Answering the Cry of the Poor), represented by Habitat president Ricky Jacinto and ANCOP’s Noli Medalla respectively. The three organizations were granted two hundred thousand pesos each, dedicated to their different sustainability efforts. Habitat for Humanity Philippines has built more than 24,000 houses in around 100 build-sites nationwide providing simple, decent, and affordable houses with the help of volunteers. ANCOP, on the other hand, has been working with Ortigas & Co. since 2002, being involved in shelter building for the poor and child education sponsorships. Question: Did the money come from OCLP or the participants of the tournament? Just asking. Circulo Verde’s accessibility allows its inhabitants to be a stone’s throw away from the rest of the bustling city. It is easily accessible via Metro Manila’s major traffic veins such as EDSA, Ortigas Avenue, E. Rodriguez Sr. Avenue (C5), Katipunan Avenue and Marcos Highway. From Circulo Verde, you can immediately reach prominent commercial centers such as Greenhills, Ortigas and Cubao. The Ortigas Center and Makati Business District lie minutes away. Prominent schools such as the Ateneo, U.P. Diliman and La Salle Greenhills and sports facilities like Wack-Wack and Aguinaldo Golf Courses are also easy to get to. Conspicuously absent is any mention that Circulo Verde is located along Marikina River. Incidentally, last night I heard a news report that Marikina Representative Marcelino Teodoro is eyeing a congressional inquiry into the construction projects along Pasig and Marikina River. That should be good. Petron Corp., the country’s largest oil refiner and retailer, will finally start relocating operations out of its Pandacan facility, hoping to complete the move in five years’ time. Petron chair and chief executive officer Ramon S. Ang said this was in line with the company’s agreement with the city government of Manila. Under the agreement, Petron would scale down oil operations over time, and eventually phase out all activities in Pandacan. In an interview with the Inquirer, Ang said Petron solely took the initiative to move operations out of Pandacan to a facility at North Harbor. Pandacan, a busy district in Manila, also plays host to two other oil companies: Pilipinas Shell Petroleum Corp. and Chevron Philippines (formerly Caltex). Shell had earlier declared it would not move out of the Pandacan depot anytime soon. The oil firms, dubbed the “Big 3,” have long been under pressure to relocate operations out of Manila. Local government officials have repeatedly warned the oil firms that their operations pose a threat to the city. The oil depot presents a target to criminals and terrorists, city officials added. While Petron’s plan is good I feel five years is too long. It would be better if this relocation will be done much faster. I hope the other companies with facilities along the river and its tributaries will also start planning for their relocation. Aside from the other oil companies Chevron and Pilipinas Shell, I hope consumer goods manufacturer Unilever will also consider doing the same. Planning for it now is the least these companies can do.